Ishihara, a senior scientist at Carnegie Melon University's Silicon Valley campus, hopes the research will lead to new levels of efficiency in solar electricity generation. With billions of dollars spent on solar installations each year, it's an important question. "We are still just understanding the long-term performance characteristics of solar panels, and that's important because when you make an investment, this will be with you for 10, 15, 20 years," he said in a recent interview. "So understanding how solar panels perform over the long term is critical. That data really doesn't exist yet." 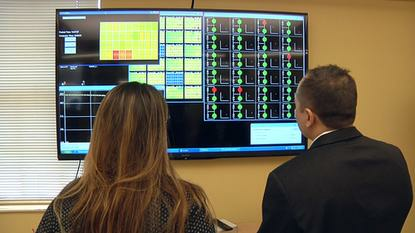 The information he's gathering comes from sensors embedded in the array, and a large screen nearby displays a representation of the solar panels' health. Most show up as green, but some are red -- an indication of possible overheating. "Our goal is to better understand the mechanisms that lead to performance degradation," said Ishihara. It's often caused by a mismatch between the performance of one part of the panel and another, which causes overall performance to suffers. That has a knock-on effect on the performance of the entire array. "These types of imperfections can worsen over time; it's that's a process we want to understand," he said. Left unchecked, that can cause performance degradation, Ishihara said. "It's really important to clean your panels."